First, Google (click to enlarge). 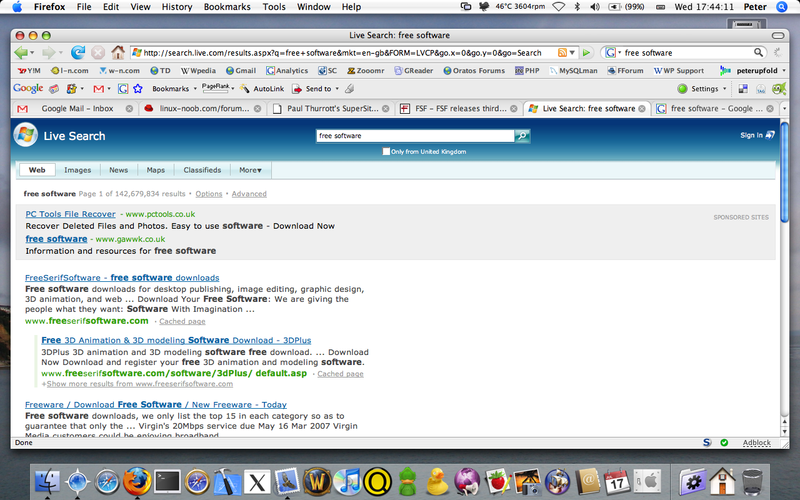 Notice that in the Windows Live Search one, there is absolutely no mention of free software as in the freedom type. Not even a scrap of evidence that the FSF exist. Now, either Windows Live Search is worse than I originally thought, or there’s some kind of conspiracy thing going on here. I hope for Microsoft’s sake it’s the former. If it were the latter, I would be very worried. It’s not Google being quirky either, Yahoo also list the FSF as the top result for the same query. Do the searches yourself – on Live Search, Google and Yahoo. UPDATE: turns out this only happens when Live Search is set to weight UK results (like when you come from a UK-based IP address through Live.com). More info. This post was written by Peter on Wednesday, March 28, 2007 at 16:56. Filed under Rants & Ramblings, Windows. That is strange, I’ve just done a search for “free software” and the first result was the FSF, although according to thie site I was logged in, maybe there is a conspiracy! 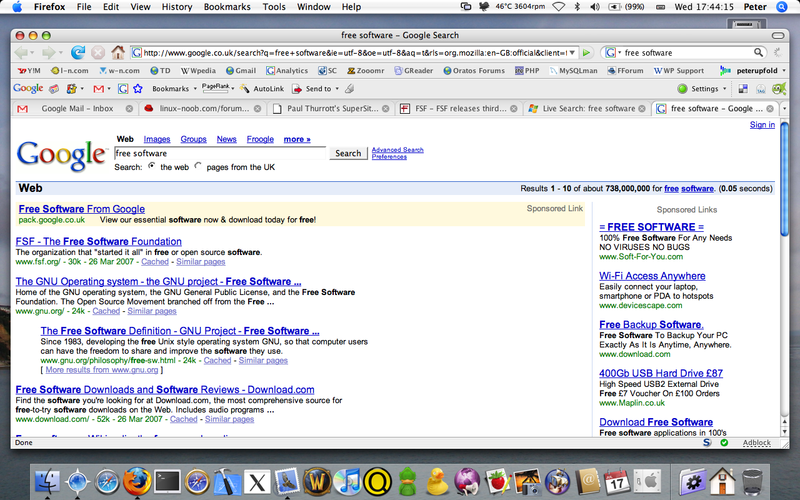 FSF is the first result for me on Live Search. If you bounce through live.com from a UK IP address, it presumably prioritises UK results and the search for some reason (still unknown) excludes the FSF. If you go to search.msn.com (or bounce through a non-UK IP), it sets the mkt value in the URL to mkt=en-us, so no UK weighting on results. Then it returns the FSF as the first hit. For privacy reasons, when I posted the link to do the search, I stripped out all URL key/value pairs except the actual query, which removes the UK weighting and the FSF comes it at number 1. Here’s the the original search link. Still, it leaves an unanswered question – why no FSF in the UK?